Why the Politics of Boxing Will Never Let Guillermo Rigondeaux Live Up To His Greatness. When Fidel Castro and the revolution came, professional sports were among the trivial things that left Cuba – only to return through amateur practice and theoretical greatness. Generations of Cuban boxers became thought experiments of who they could have been or should have beat. These hypotheticals filled boxing fans with daydreams of what would have gone down if Teófilo Stevenson had taken the multimillion dollars to defect Cuba and fight Muhammad Ali. But he didn’t. And all we have is one romantic Stevenson quote: “What is a million dollars against eight million Cubans who love me?” Likewise, we can only imagine a fight between Félix Sávon and Mike Tyson. But like Stevenson before him, millions of dollars didn’t lure Sávon away from home. We are left transposing Tyson onto one of his supposed successors, Shannon Briggs, whom Sávon easily defeated in front of Fidel and Stevenson. Guillermo Rigondeaux is the last of the great Cuban boxing triumvirate, and likely the best of them all. But unlike his predecessors, he left the island and was branded a traitor and “Judas” by Castro. And on Saturday, Rigondeaux will be Cuba’s first great boxer in almost 60 years to realize his potential – at least partially. When Rigondeaux faces the Ukrainian Vasyl Lomachenko, it’ll be the second time he fights a top pound-for-pound boxer. Four years ago, he beat Nonito Donaire – the reigning fighter of the year – with surprising ease. Since then, Rigondeaux’s career has suffered. His former promoter, Bob Arum, has publicly discussed Rigondeaux’s lack of marketability, going so far as to say HBO didn’t want to broadcast his fights and that even the mention of his name made network executives vomit. The problem with Rigondeaux – if we can classify it as such – is that he is too good in the worse possible way for boxing. Freddie Roach, the great trainer who’s guided Manny Pacquiao into one of the best boxers of his generation, described Rigondeaux as, “one of the greatest talents I’ve ever seen…Probably the greatest talent.” And yet, Rigondeaux’s style is the type that alienates those who watch boxing for violence. Rigondeaux is thoroughly of the Cuban school of boxing, which when compared to other Latin American styles, especially from Mexico, is removed from machismo. Cuban boxing is a calculated, scientific style that – as Rigondeaux demonstrated in his fight against Donaire – frustrates opponents along with large segments of fans who consider that methodical style boring. To be fair, watching Rigondeaux box can become tedious. But he is nowhere near as banal as he’s made out to be. This idea has gained momentum as two of boxing’s most popular, major outlet writers have repeatedly criticized Rigondeaux’s fighting style. Rigondeaux’s lack of popularity makes it so that there’s little monetary value to gain in fighting him. If this wasn’t bad enough, Rigondeaux’s supreme skill made him almost unbeatable during his prime. A combination of these two factors make it so that the Cuban boxer is easily and often avoided. Boxers will risk a loss if it means making millions, but they won’t if it means making a fraction of that. As a result, Rigondeaux has spent the better part of the last several years calling out top-level opponents, Leo Santa Cruz and Carl Frampton, who’ve each given reasons for not fighting including lack of money – reasons Rigondeaux has repeatedly mocked. He has also called out Lomachenko, who finally bit, but only if the fight occurred at the Ukranian boxer’s 130-pound weight class – two weight classes above Rigondeaux’s fighting weight. “[Weight] has nothing to do with it,” Rigondeaux explains in Spanish, “We are ready for 130, 140, and whatever else comes.” But despite Rigondeaux’s optimism, the weight along with age – he is 37, eight years Lomachenko’s senior – are factors, especially for the lighter weight classes where each pound is magnified. His fight against Lomachenko in New York’s Madison Square Garden will also mark the first time two, two-time Olympic gold medalists fight each other. Rigondeaux won his in 2000 and 2004 while Lomachenko earned his in 2008 and 2012. And as skilled and decorated as an amateur as Rigondeaux is, Lomachenko may be his equal. Though, again, as with the weight challenges, Rigondeaux is unconcerned. “We are ready for whatever…that, for me is no type of problem,” he says. As one would expect of a person who’s experienced what Rigondeaux has, the boxer seems completely unfazed by the advantages he’s given up in facing Lomachenko. Always in shape and four months into his training for Saturday’s fight, Rigondeaux appears extra motivated – in part because Bob Arum promotes Lomachenko. When asked about the prospect of defeating another one of the promoter’s top fighter, Rigondeaux, takes it as a given. “This will be his second fighter we’ll give a piñaso to,” says Rigondeaux about Donaire, who was also promoted by Arum and was, at that point, his prized fighter. 2017 has been a great year for boxing and even if not the most anticipated by casual fans of the sport, Saturday’s fight between Guillermo Rigondeaux and Vasyl Lomachenko may be the best. Both are among the most skillful boxers of this generation and on the short list of boxing’s greatest amateur boxers. As professionals, however, Lomachenko and Rigondeaux’s careers have taken divergent paths. For all the breaks that Lomachenko has received, Rigondeaux has been given challenges. Granted, none of Lomachenko’s good fortune is without merit, but conversely, obstacles placed in Rigondeaux’s path are excessive. This includes last week’s decision by a sanctioning body to strip Rigondeaux of his 122-pound title if he loses to Lomachenko – even though they are not fighting for that title. As a result, Rigondeaux has unfortunately lost part of his prime due to politics both in and out of the sport. If Rigondeaux wins, we may be witnessing the greatest boxer of the last half-century. And yet, like so many masters whose nuance of their talent is not greatly understood and thus, misrepresented, Rigondeaux lacks proper appreciation. And if he loses, which seems like the greater likelihood, it will be because age finally caught up with him and at this point of his career, he cannot overcome all the disadvantages he’s faced, and – at least against Lomachenko – has willingly taken on. Author boxingandhistoryPosted on December 8, 2017 April 1, 2018 Leave a comment on Why the Politics of Boxing Will Never Let Guillermo Rigondeaux Live Up To His Greatness. 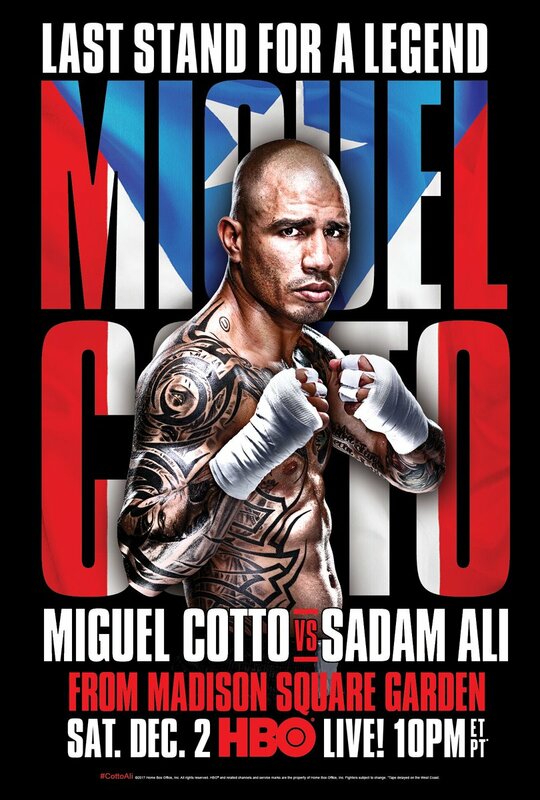 Cotto’s last opponent—for a fight that’s being promoted as Last Stand for a Legend—is Sadam Ali. Despite having just 1 professional loss and a distinguished amateur career that included representing the United States in the 2008 Olympics, Ali has been only a fringe contender who is now moving up a weight class to face Cotto. That Cotto is facing Ali is not the Puerto Rican’s fault; it’s a matter of boxing politics. Options for a final opponent included the winner (or loser) of September’s fight between Saul “Canelo” Alvarez and Gennady Golvokin fight. But when their fight ended in a draw, the option of having Cotto face either for a December bout fell through. Other names mentioned as possible opponents included Jesse Vargas and Juan Manuel Marquez, the latter of whom retired in August. Errol Spence Jr. and Mikey Garciawere also options but, with Cotto’s promoterGolden Boy insisting a fight against their fighter include the opponent sign a long-term deal with them, both Spence Jr. and Garcia passed. David Lemieux was also an option, but it always seemed unrealistic that he could cut enough weight to face Cotto. And so, we end up with Cotto facing Ali to end a career that 5 years from now will get him enshrined into the International Boxing Hall of Fame. Aside from the successes, however, some of the lasting memories of Cotto verge on the tragic. In examining Cotto’s career, we can split it into 2 phases: before and after he fought Antonio Margarito. In 2008, Cotto was a 27-year-old undefeated welterweight champion. Margarito was 30 and–despite the 5 loses on his record–enjoyed the distinction of being among the most avoided boxers; that includes Floyd Mayweather turning down a then-career high payout to not face the Mexican fighter. His fight with Cotto continued the great Mexico versus Puerto Rico boxing rivalry, and in the first 5 rounds, the boricua’s superior skill and speed dominated Margarito. But, as the fight progressed, Margarito’s constant pressure erased those advantages. About half way through the 11th round, Cotto took a knee to avoid Margarito’s punches. Some 40 seconds later, he took another knee before standing up and–with a bloody, dejected look–Cotto signaled to his corner to stop the fight, all while his wife and children sat in their seats, stunned and crying over the beating they saw first-hand. For different reasons, neither Cotto and Margarito were the same after their fight. After the loss, Cotto supposedly cried tears mixed with blood. After his win, and before his next fight, boxing officials caught Margarito using illegal hand wraps—“a plaster-like substance”—for which the sport banned the fighter and his trainer. Boxing commissions reinstated Margarito more than a year later, while Cotto continued to struggle after the loss. Often time, a championship boxer’s first loss is more emotionally damaging than physically. His aura of invincibility gone and convinced Margarito fought with loaded gloves during their fight, Cotto appeared lost. “Margarito took a lot of things from me,” Cotto would later explain. “Trust, confidence, and other things that made me the boxer I was.” Counting his loss to Margarito—which he’d later avenge—Cotto lost more than a third of his last 14 fights, including against every top opponent he faced. Manny Pacquiao, Floyd Mayweather, Austin Trout, and Saul “Canelo” Alvarez all handed him loses while his best victory, on paper, came against Sergio Martinez who, by that time, fought on one leg and with brittle hands. Away from the ring, Cotto also lost his father, who died unexpectedly from an asthma attack at age 57. “He died on January 3, 2010,” Cotto said. “I remember the day. We had some unfinished business between us. But he is my biggest hero. If I could have my father back for one day, I would say to him, ‘thank you.’ Those are just words but I would mean them.” To honor his father, Cotto has a portrait tattoo over his left shoulder with “54/10” underneath it, symbolizing the years of his father’s birth and death. Cotto eventually turned to the great boxing trainer Freddie Roach, who helped resuscitate part of the fighter’s final years. Both Cotto and Roach, along with others, dispute his loss to Alvarez and openly sought a rematch. Alvarez vs. Cotto II will not happen unless the Puerto Rican great continues to fight past this year—which he’s continually said he won’t. Cotto is adamant that Sadam Ali will be his last opponent, though boxers rarely stay retired. Cotto is 37 years old now. He is likely the greatest boxer Puerto Rico ever produced but, since he is quiet and reserved, he probably won’t be remembered with the same reverence as the charismatic Hector “Macho” Camacho or Tito Trinidad. The latter fighter became a national hero, in part, when he entered the ring against Oscar De La Hoya with a “Paz por Vieques” sign, protesting the United States’s Navy using the small island—just east of Puerto Rico—as a bombing and testing site. All of this seems fine with Cotto, who, despite his reputation for being a quiet, serious person, is known by his friends for his loyalty and constant joking. The main reason boxers rarely stay retired is they can’t afford to not fight. Not so for Cotto, whose father invested many of his earnings wisely, and who doesn’t appear as the type of boxer forced to keep fighting long past his prime. He’s also not delusional of the natural athletic decline that comes with age. If Saturday is Cotto’s last fight, he seems more than content with what he’s accomplished. He wants to stay in boxing through his promotional company, and help Puerto Ricorecover from the hurricanes that devastated the island. But more than anything, after December 31, 2017—which he’s repeatedly mentioned as his last day as a boxer—Cotto is excited about spending the rest of his days with his family.